SKU: 02. Category: Peripheral Devices. 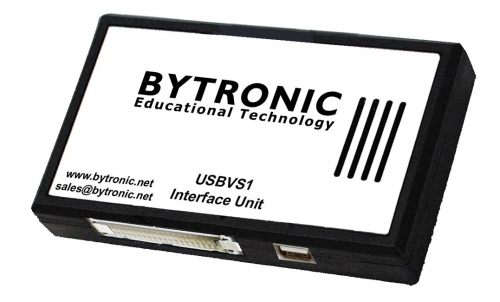 The USB interface enables a PC to control target devices such as the multi-applications board, bead sorter, washing machine simulator or CST through a USB. Signals from the 8255 and 8254 devices are taken to a 40 way header (compatible with the 40-way connector on the other Bytronic products). The USB interface uses the HID (Human Interface Device, the built in HID driver which is part of the operating system) protocol to communicate with the host PC removing the requirement for a specific device driver. The IO transfer is approximately a 64byte packet every millisecond sufficient for target devices such as the multi-applications board. A Windows DLL is available to enable control from Visual Studio C++, C#, VB.Net. A number of sample Visual Studio C++, C# and VB.Net projects are provided enabling users to develop their own programs. • 8255 general purpose programmable peripheral interface (PPI). The device has twenty four I/O lines arranged as three ports A,B and C. Port A consists of one of 8-bit data output latch/buffer and one data input buffer. Port B consists of one of 8-bit data output latch/buffer and one data input buffer. Port C consists of one 8-bit data output latch/buffer and one input buffer. This can be split under mode control into two 4-bit ports. • 8254 programmable counter/timer chip with three independent 16-bit Counter Timer Channels (CTCs). Multiple modes are available, programmed in software, and each CTC can be clocked at up to 5 MHz. CTCs 0, 1 and 2 are functionally identical and each have two inputs, clock (CLK) and gate (GATE) and one output (OUT).